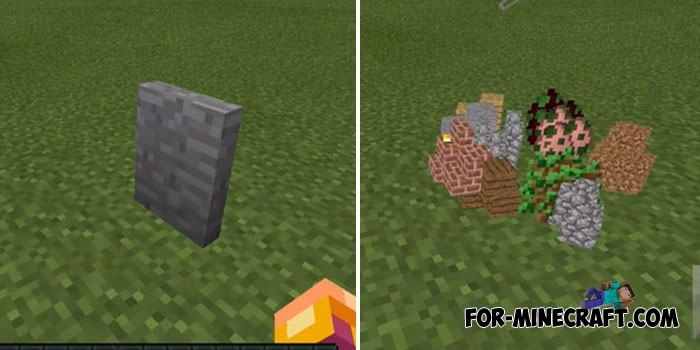 Gravestone mod can save your items after death in the place where you died in MCPE. The mod is very simple and does not require absolutely anything, but rather is a small helper that will not allow your things to be lost. For example, you play the survival mode and set the maximum difficulty, in which case you will know that the accumulated items will not be lost and you can return to the point of death at any time and take everything back. The tombstone will appear in the place where you died. It will stay there until you break it. All items that were in your inventory will be in the tombstone. Therefore, any death now is not terrible for you (but know that the experience will be gone, use the Exp Chest Mod that allows you to put the experience right into the chest). The grave is quite solid so take a pickax to break it faster. Any death is counted, even if you fall into the lava. The tombstone texture is slightly changed, but you will immediately notice it at a short distance. 1. Download the mod for your version of the game and install BlockLauncher. 2. Start BL and activate the mod (click on the wrench -> ModPE). Exp Chest Mod v2.3 for Minecraft PE 1.0/0.17.0Now you can forget the endless search for the experience, because Exp Chest Mod will give you the ability to store it in the chests!